The shirt at the top of my shopping list right now has been a long time coming.On September 13th, 1971, designer Stella McCartney was born to father Paul McCartney, Beatle and man who convinced guys to give Chelsea boots a shot. That worked out pretty well.In 1987, she interned for legendary Savile Row tailor Edward Sexton (he made Paul’s suits for years).In 2001, she launched her eponymous label and started making the type of cool, relaxed clothes that men want to wear, but for women.Last year, she announced she was finally getting into menswear, and on November 10th, she debuted the damn thing.The collection as a whole was inspired by the rebellious ’60s, but the shirt that caught my eye is more fit for a bowling alley than a protest rally.It’s this Camp-Collar Striped Cotton-Poplin Shirt ($345). 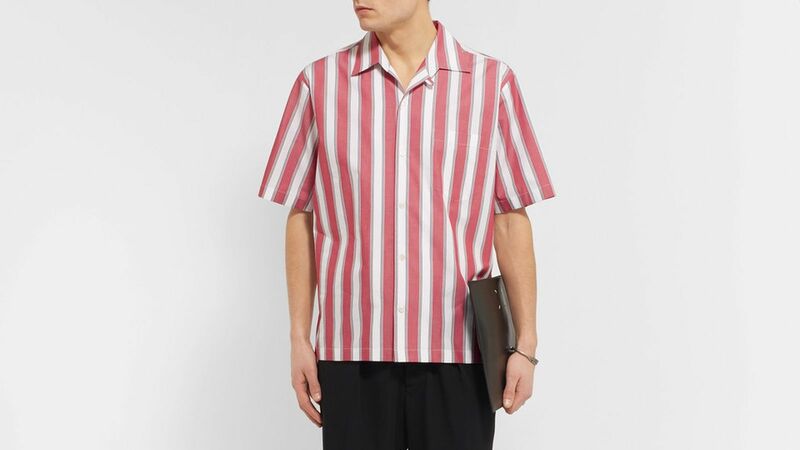 The pink, grapefruit-y striped shirt looks like what a man working in a 1950s diner might wear to serve you a banana split, or a milkshake with two straws for you and a date. It also doesn’t hurt that “camp collars” — a collar without a band that’s meant to be worn open — have been popular among designers like Prada, Saint Laurent, Gucci, and Dries Van Noten.